Scientists have announced the first successful attempt to trap and hold antimatter atoms. The research team managed to hold on to 38 antimatter atoms for about 2 tenths of a second. It may not sound like much, but it's the first time that such atoms have existed for more than a mere instant. 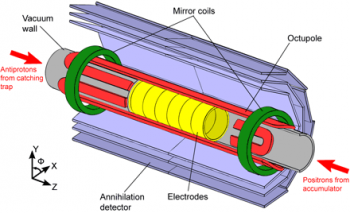 Antimatter atoms, like the antihydrogen used in this experiment, were first created only 8 years ago. The difficulty in hanging on to them lies in the fact that antimatter must be kept from coming in contact with any form of matter, or the antimatter and matter will annihilate each other in a burst of energy. While manipulating a standard atom or molecule can be done easily, the inability to come into direct contact with the antihydrogen atoms made trapping them difficult, especially considering they have no net charge, so cannot be trapped using traditional electric or magnetic fields. Instead, scientist built a 'magnetic bottle' using sculpted magnetic fields, which could hold the atoms, assuming they were not moving too fast. Gerald Gabrielse of Harvard is one of the scientists working on the project, and was the first to propose the magnetic bottle. "I'm delighted that it worked as we said it should," he said. So are we going to see an antimatter-powered starship any time soon? Probably not. "We have a long way to go yet; these are atoms that don't live long enough to do anything with them. So we need a lot more atoms and a lot longer times before it's really useful - but one has to crawl before you sprint," said Gabrielse.